The MG3690A Synthesizer has been upgraded to a B model - MG3690B. The MG3690B maintains full backward cabability with the MG3690A, while offering higher output power levels and faster frequency switching speeds. Of-course unlike the MG3690A, the MG3690B will return "MG369XB" instead of MG369XA when it is queried for its ID. The MG3690A is a broadband high performance signal generator that covers RF and microwave frequencies from 0.1 Hz to 65 GHz in a single instrument. For mmW frequencies, the MG3690A?s coverage can be extended up to 110 GHz or beyond, with external multipliers. The MG3690A family is extremely configurable to meet your exact need, minimizing your initial investment. It is also very adaptable with a comprehensive list of upgrades for your future needs. 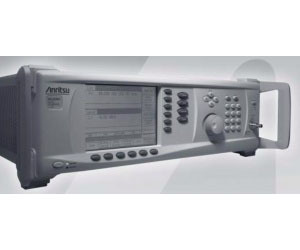 Furthermore, since the MG3690A can be customized for specific applications, please do not hesitate to call 1-800-ANRITSU with your special hardware of firmware request. The MG3690A is backed with a complete 3-year warranty, which comes as a standard feature. The MG3690A offers all the capabilities of a high-end microwave generator at the highest performance level. It leverages the technology-leading phase noise performance of its predecessor, the 69C series. It offers outstanding output power with the lowest spectral purity content. Frequency can be swept digitally or via an analog ramp sweep. A CW frequency could be phase offset or locked within an external phase lock loop. Amplitude, Frequency, Phase, and Pulse modulations are available externally or internally-driven. An external software package simplifies the use of these modulations simultaneously, and allows the down-loading of user-defined modulation waveforms. For IQ modulation, the IF input option allows the easy up-conversion of an externally IQ-modulated RF signal.